The Nigeria Police Force has invited Senate President, Senator Bukola Saraki to report at the Force Intelligence Response Team office at Guzape, Abuja to answer allegations against him by some of the suspects in the Offa robbery. 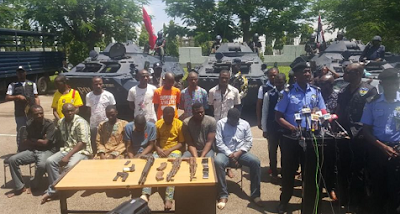 On the invitation of the Saraki, the Force Spokesman, ACP Jimoh Moshood said: “Senate President, Sen. Bukola Saraki is being invited to report to the Police to answer allegations indicting him from confessions of Five gang leaders arrested for active participation in Offa Bank Robbery and Killings of 33 innocent persons. On the update into the investigation, Moshood said : “The investigation into the Offa Bank Robbery and gruesome killings of more than 33 Innocent persons in Offa, Kwara State on the 5th April, 2018 directed by the Inspector General of Police, IGP Ibrahim Idris has made significant progress, successes and more revelations have been recorded.